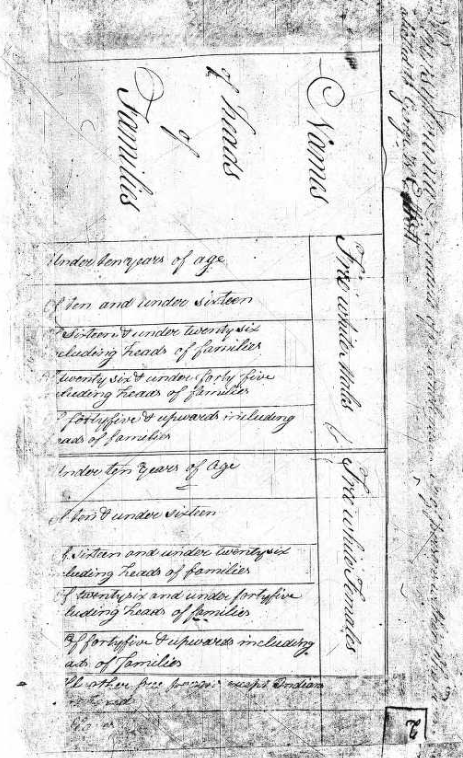 The U.S. Census data for 1790-1840 consists of household-level data for the United States at the time of enumeration. There is no individual-level data available in these years, and the detail of household data is largely dependent on the particular census year. In contrast to later U.S. censuses, these historical censuses named only the head of the household and tallied household totals attached to that record (See image above from the 1800 U.S. Census, provided by Ancestry.com). For this reason, person-level information is not available, and information about total persons can only be tabulated using household totals. All of the years have missing data, and in some cases, whole states are missing. Thus, the household-level microdata does not always match the published county-level totals. To help identify the missing areas and other issues in the data, county-level summary data is also available. Each county-level variable gives the total from published figures for that county. The data can be merged onto the household-level data files using YEAR, STATEICP, and COUNTY. To help users interested in using the data, IPUMS-USA has created extended documentation detailing known issues. This resource is intended to help users find if a problem related to the county or variable in question has already been flagged. We encourage users to email ipums@umn.edu with questions regarding the data, or to report data errors or issues. This data release is part of the MPC’s work with Ancestry to make freely available to researchers worldwide 100% count U.S. Census microdata through 1940. This dataset will include over 650 million individual-level (1850-1940) and 7.5 million household-level records (1790-1840). *County level datasets from ICPSR Study 2896, Part 1-6, also available via NHGIS.